No matter how cold the weather may be getting, you can always rely on music to remind you about sitting in the Summer sun. 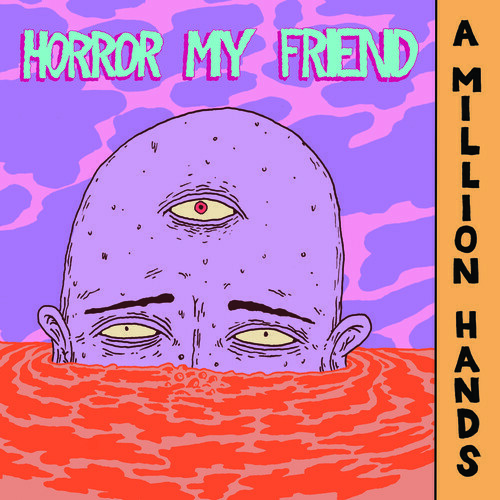 Such is the case for Horror My Friend, and their debut EP, A Million Hands. No Energy opens the EP – which seems almost ironic in terms of song titles, as the track is brimming with that warm, bubbly energy that is instantly infectious. The melody combines the gloriously upbeat, indie-rock vibe that Australian bands seem to be nailing at the moment – with a refreshing, pop-tastic rhythm that makes you want to get up and dance. The industrial techno feel of Nothing continues the good vibes of the previous track, offering you the chance to continue your dance party frenzy. However, it’s once the chorus kicks in that the band really shine, with the melody intensifying with each ensuing note. Not to be outdone, Be Good kicks off with an 80s rock riff that wouldn’t look out-of-place on a Guns N’ Roses album. As the riff builds, the bands signature indie-melody blends into the guitar work perfectly; demonstrating their ability to combine two completely different elements into one, unique and refreshing sound. Kaleidoscope stands out as a personal favourite on the EP, its whirring, distorted sound wrapping you in warm embrace – like greeting an old friend on the street; whilst Colourblind takes a slightly more mellow path, turning the intensity down slightly, if only for a moment, before launching into a cascade of rippling electro-pop. It seems that the band have left the best for last though, with A Million Hands ticking a lot of “how to write an infectious song” boxes. Undoubtedly, it’s in this final showdown that the band combine all the elements that filtered through the previous tracks, bringing them together to create an impressive and interesting piece that is sure to win many hearts and minds. Overall, A Million Hands is a feel-good EP that boasts an impressive soundscape of soaring melodies – ones that will leave a smile on your face and a warmth in your heart.